Break-in • Police say shooting was justified act of self-defense. Springville • He trudged through the snow Thursday morning, trying 20 doors before he was able to find one he could break into. Then the intruder made himself at home. He removed his wet clothing and put on some clothes that had been folded in a pile on the sofa. In the kitchen, he found ingredients to make a ham-and-tortilla wrap. He put the leftovers in the family's refrigerator. It would be his last meal. At 2:45 a.m., the intruder went upstairs and woke the couple who lived in the home, said Springville police Lt. David Caron. He told them he had a stolen gun and demanded they get out of bed. He ordered them to get their wallets and take him to an ATM. So the husband went to his closet. "The suspect thought he was going to get his wallet, but instead, he grabbed his handgun," Caron said. The husband shot the intruder once in the chest. The man died at the scene. Police identified the dead man as 31-year-old Armando Martinez Jr., whose last known address was in Provo. Caron called the fatal shooting at the duplex near 800 South and 475 East justified self-defense. "Someone comes to your bedroom at 3 in the morning and says he has a gun, you believe him," he said. The couple's three small children were sleeping in a nearby bedroom and were taken to a relative's house as the husband and wife talked with police. "It's a pretty frightening experience," said Caron, who added that the couple were traumatized. "They held together pretty well for quite a while, but I think emotionally it started to take its toll." The intruder did not display a gun, and police found only the resident's gun at the scene. However, police say the intruder's behavior is similar to that of a man who stole a gun from another house last week. The intruder in that case went into a house while the residents were at home, threatened them and took their gun, Caron said. Springville police are working with other agencies to investigate whether the man may have committed other robberies. Neighbors expressed their shock and worry at what happened. Erin Brand, who lives two doors down, said the family members are "wonderful people" her children play with and go to church with. "It's a little scary to think about it because our house has the same layout as their house, and even though it wasn't my home, it makes you feel violated," Brand said. She said she doesn't feel unsafe because the chances of something like that happening there again are remote and it could happen to anybody. Brand hopes her neighbors, who are staying with relatives, return to the neighborhood. "I hope they will come back," she said. "It would be so sad if they didn't, but I don't know what they will do. But I wouldn't blame them if they didn't. " She has no doubt, though, that the husband was justified in his actions. "He was protecting his family and did the right thing with the information he had at the time," she said. "You do what you need to do to protect your family if they are in danger," she said. She said the morning's events shook her up. "It's really scary, especially when you have kids," she said. While most neighbors describe the neighborhood as fairly quiet, Larry Haynes, who lives down the street, said he has had items stolen from his truck in the past and he always makes sure his cars and home are locked. "I feel bad for the family, that they had to go through that," he said. "It's a little harsh, but it's better than them getting hurt." 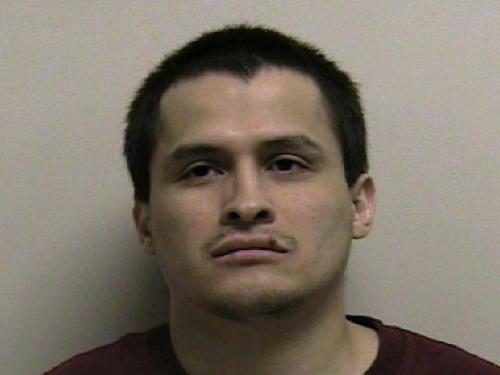 Utah court records indicate Martinez has a lengthy criminal history spanning from 1998 to 2011. Martinez was convicted of various charges of theft and shoplifting, attempted aggravated assault, criminal mischief, and assault against a police officer, and drug charges. In Martinez's most recent case, a felony retail theft in 2011, there was question of his mental competency. He ultimately was deemed competent and found guilty of an amended class A misdemeanor charge in January.  Cimaron Neugebauer contributed to this report.